Octopuses are a variety of cephalopod. Although there are roughly 300 distinct octopus species -- from the tiny 3/8-inch Californian octopus to the giant Pacific octopus that can measure up to 30 feet -- they all have certain characteristics in common. Apart from size differences, all octopuses have a similar anatomy and structure. All have eight legs, which are almost always covered in suckers on the undersides. What you might think of as octopuses' heads are actually called mantles, and they contain all their internal organs. Octopuses are made of roughly 90 percent muscle and have no internal or external skeleton, which is why they can fit in some seemingly impossibly small spaces. 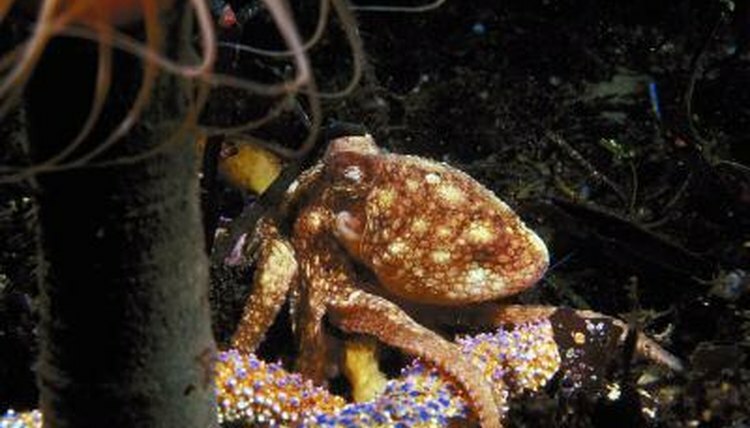 Octopuses can be characterized by the habitat in which they live. All 300 species live in seas and oceans -- there isn't a single freshwater octopus. Within the confines of a marine environment, these creatures can be found almost anywhere, in both tropical and temperate waters, from coastal waters to coral reefs to the ocean floor. Octopuses are keen nest builders, often making nests in rock crevices, where they can hide from predators. Every octopus has a hard beak, which it uses to bite and kill its prey. The beak is so tough it can even break through the shells of crabs and molluscs. The exact type of prey they go after depends on the species and its size, but they're carnivores, so they eat a range of meaty foods, such as fish, scallops, crabs, molluscs and even other octopuses. They prefer to do their hunting at night. Sadly, octopuses have very short lifespans. On average, they only live around 6 months. However, some larger species live significantly longer, although still a short amount of time for their size. For instance, giant Pacific octopuses can live up to 5 years. Octopuses have a range of predators -- including sharks, seals and dolphins -- so they need to have effective forms of defense. All species have special adaptations to the pigment cells in their skin, which allow them to rapidly change color and pattern, camouflaging themselves almost instantly. If this fails, they're also able to squirt a dark ink out of their bodies, which confuses predators and allows them to make a swift escape. What Do Jewel Squids Eat? What Are the Suction Cups Used for on the Tentacles of a Squid? How Do Animals in the Ocean Protect Themselves? What is the Arm of the Squid? What Does a Starfish Look Like? What Is the Black Liquid Coming Out From the Octopus?